When Artesia local Bill Morton was performing general maintenance on Grammy’s House properties earlier this month, he never thought he would be called a hero. In fact, he didn’t even know awards for this type of volunteer work existed. 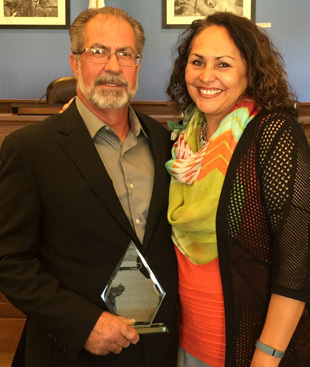 Morton received the New Mexico Coalition Against Domestic Violence (NMCADV) Community Heroes Award Sept. 24 in Taos. Each year, the NMCADV honors select community members for their contributions and support of domestic violence work. Morton owns Cherokee Builders, a general contracting firm, which operates in Artesia. Through his business, he works with Grammy’s House, Artesia’s domestic violence shelter, on regular occasion. He has helped by remodeling their office space, remodeling domestic violence shelters, and performing standard maintenance. Morton’s desire to help domestic violence victims begins at home. Morton wants to bring awareness to domestic violence because “it used to be a dark secret in people’s families,” and according to him, silence hides violence. The month of October, as proclaimed by Mayor Phil Burch Tuesday, is Domestic Violence Awareness Month in Artesia. Grammy’s House is hosting events throughout October that revolve around the issue of domestic violence, including a walk from Eighth Street and Texas Avenue to Central Park at 5:30 p.m. Friday, Oct. 2, and a showing of “The Saga of Diamond Bessie: A Tale of Love and Murder” at 5:30 p.m. Tuesday, Oct. 6, at First Christian Church. Grammy’s House is also encouraging Artesians to wear purple Tuesday, Oct. 13, and email photos to [email protected], and invites the public to a facility tour and coffee in appreciation of its donors, supporters, staff and volunteers from 4-6 p.m. Tuesday, Oct. 27, at 811 W. Texas Ave.
For more information, contact Celina Bryant at 748-1198 or Grammy’s House’s 24-hour Crisis Line at 365-5144.